It's summer- which means grills are firing up all over the country. 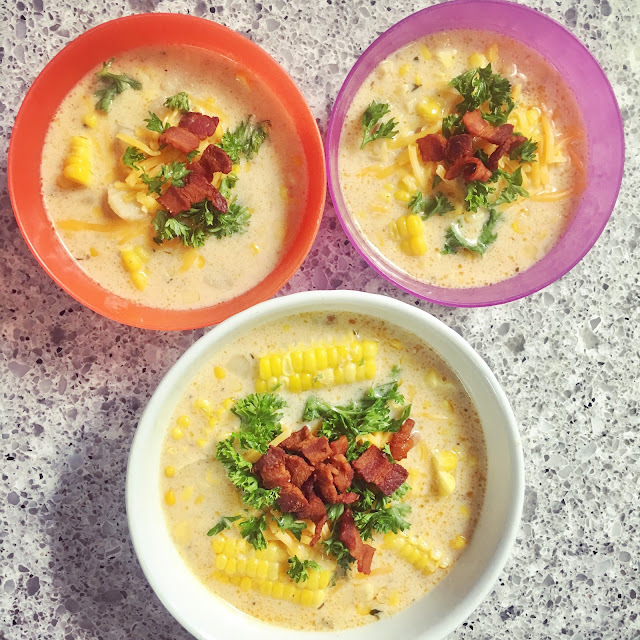 One of my favorite summer dinners is grilled corn on the cob and chicken quarters. I always cook way too much food which means I always have leftovers laying around. This is a good meal to use up extra corn and chicken. If you don't have leftovers, fresh works equally well. I've even used can corn in a pinch when I couldn't find fresh corn. 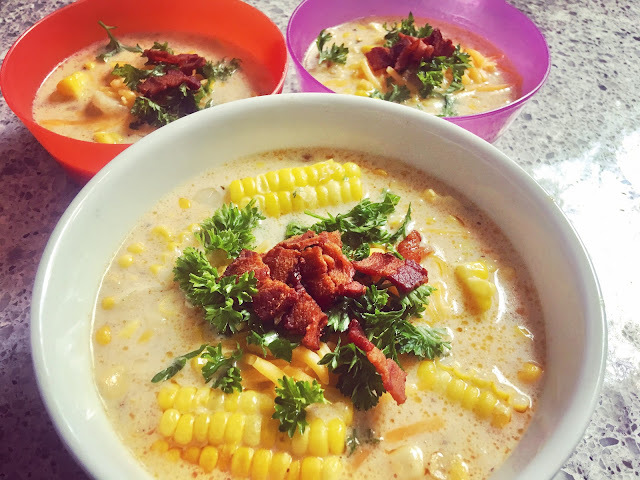 My corn chowder is full of sweet corn flavor, chunks of juicy chicken, and bacon. How can you possibly go wrong? I top it with fresh parsley to give it that extra bit of brightness. This is a great summer recipe that's filling and easy to freeze. In a large pot, cook the bacon pieces until crisp. Remove from the pan, leaving the drippings, and set the bacon pieces aside. Place the potatoes and onions into the pot and cook over medium heat until the onions have softened, 2 or 3 minutes. Sprinkle in the flour and cook, stirring constantly, for about 1 minute. Pour in the milk, chicken stock, Old Bay, thyme, 1 tablespoon parsley, cayenne, salt, and pepper. Stir well. Bring to a boil over medium heat, stirring occasionally. Reduce heat to low and simmer for 12-15 minutes or until the potatoes are tender. Add corn (If using fresh corn, cut from the cob with a sharp knife. Use the back of your knife to release the pulp from the cob. ), and chicken. Cook over low heat until heated through, about 5 minutes. Garnish with remaining parsley, bacon pieces, and cheddar cheese.